Info: Corncribs have been constructed and used since Colonial times for the drying and storage of feed corn. They became particularly popular with the rise of Indian corn as an animal feed during the mid-nineteenth century. 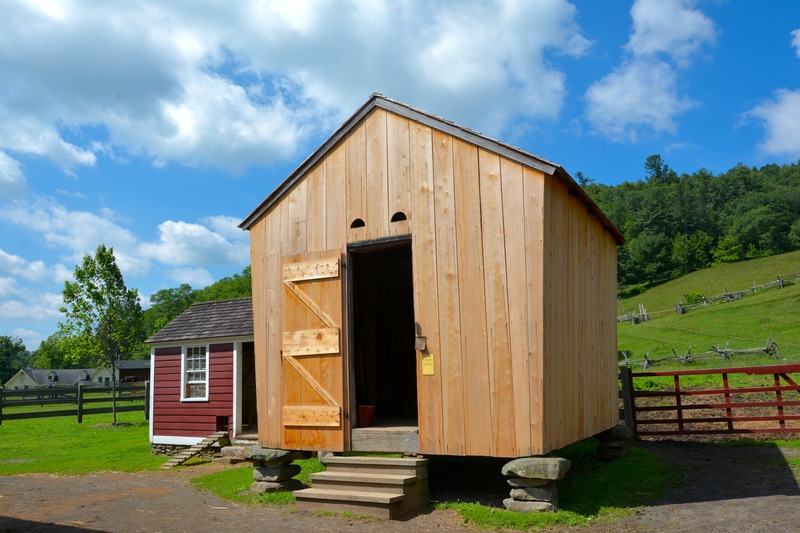 The Brooks corncrib is of the style known as the Connecticut Corn Crib or the Connecticut Corn House, which was the predominant style in the Northeast throughout the nineteenth century. William Brooks ran a small operation, with only forty animals total in 1875. He did not produce a great deal of Indian corn. Therefore, the simplest corncrib with only one set of storage bins was adequate to serve his needs. Provenance: The Farmers' Museum acquired the corncrib from Charlotte Spicer Layton. *Charlotte Spicer Layton acquired the property from Mort Brooks on April 28, 1943. *Mort Brooks became sole owner on August 7, 1942. *Esther Spicer and Mort Brooks inherited the property from Fred Brooks on April 4, 1941. *William Brooks purchased the property from Smith and Adaline Mayhew on August 13, 1868. *Smith and Adaline Mayhew purchased property from William and Phoebe Mayhew on June 15, 1849. *William Mayhew purchased property from John Taylor September 24, 1822.